I have a few pots of indoor plants and none of them is the flowering kind except for my orchids and Christmas cactus. My African violets have not flowered for a long time. I have never had much success with African Violets but I keep buying them when I see them at the supermarket! I received my first pot of orchid from a good friend. It was a Welcome Home gift after an extended stay in Malaysia in 2004. Since that time my orchid has never failed to bloom at least once a year. If I am lucky it'll bloom twice a year. The amazing thing which I never noticed from my mother's orchids back home in Malaysia is that the flowers can stay on the stalk for as long as three months! The orchid in this picture has been blooming for more than two months now. After the flowers have withered, I will have to transplant it to a bigger pot. It has outgrown its little pot, the one it came in with from the store. I think I need to give it more orchid food so that in future it'll have larger blooms. In January I bought two pots of orchids for about $10 each at Big Lots. One died from over-watering. :-( Now I know not to let the pot sit in a dish with water in it! My Malaysian friend who is living in Florida was surprised when she saw my orchids. She didn't know that they can grow indoors. 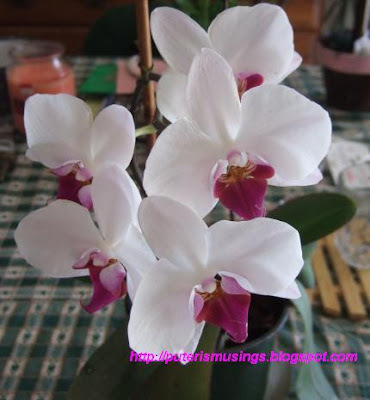 (Her mother has some really beautiful orchids back home in Miri too.) Well, you do have to put them where they can get some light, so I put my orchids by my sliding door which gets some morning sun. I water them using a spray bottle, so the whole plant can get some moisture. Seems to work on them. Nice orchids. My aunty like to grows them too. I think my grandmother also planted some at home. Hehe...usually never notice the plants, after work, reach home, out from the car, straight into the house. hmm...when u do your gardening, ever talk to the plants? I forgot where i read, i think it helps. Will have to search my memory banks on where i read it from. Orchids are beautiful. So you are one of those men who don't do gardening! Hahah. I have a few men friends who love growing orchids .. not here lah, back in Malaysia. I have never talked to my plants. I only mumble to myself about the condition of my plants .. forgot to water lah, complain about their pitiful state lah, that sort of thing, never actually talked to them. Ya I read somewhere also that talking to plants are supposed to help them .. I think I read somewhere that Prince Charles talks to his plants! lovely plants.. watering the orchid with the used water after you wash your rice will make them look more beautiful.. try it. works for my orchids..
Seahorse, I have never heard about using rice water to water orchids. I will have to give it a try .. I cook rice almost everyday, so plenty of rice water to use for watering!